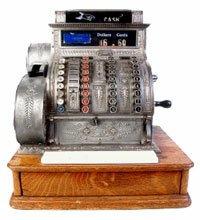 The trusty cash register is the foundation of a classic cash management system. No store can operate properly without one. That’s why TRIO Display carries a complete line of cash registers. From the most basic battery operated portable machine to one that offers departmentalized sales reporting, we have a solution for your cash register needs. We also carry a complete line of cash register paper rolls and cash register ink rolls and ribbons at economical prices.